I’m a big believer in the quick win. Especially when it comes to hobby gaming. Quick wins, as the name suggests, are small projects that don’t take much time, or effort. The miniature you paint in an hour, the terrain you bang out in 3 hours, or the monster stat block you write in 5 minutes all fall into this category. Getting things done is very motivating. My recent post about painting RPG miniatures gets into that more. The reverse is also true though, that having too much on your plate can turn you off of your hobby quicker than a quickling in hyperdrive. It’s also great having something to show for your efforts, and with a string of quick wins you can easily build up to a much larger goal. It’s a lot like how I write now. My current RPG book — teasers here, here, and here — is being written in 2-hour bursts. In each session, I aim to finish one section of the book. Sometimes I’ll get 2-3 monsters done, sometimes it’s most of a background, but every session that I finish something is another thing off the checklist. How’s this different from how I used to write? Before, I didn’t break down my tasks much, so in 2 hours I often worked on a bunch of sections, got demotivated, and lost my concentration. That kind of thing can lead to burnout. In other words, I’m talking about the tortoise’s approach to winning the race: slow and steady, and about breaking down that race into milestones. Each milestone is a victory in and of itself. Life also takes up much of our hobby time, so when we have time, we need to use it wisely. I’ll leave you with this thought. What small hobby project would give you the most satisfaction. Is it drawing that dungeon map you’ve been planning? Making a handout? Stating up an NPC? Or do you just need to run a short session over Google Hangouts to get everyone ready for a longer session? Plan it. Do it. Celebrate your quick win. Looking for some unique gaming gift ideas? D20Radio.com has some excellent gamer gift ideas worth checking out. 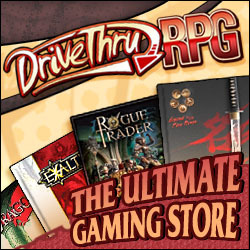 Right now, all our books are 33% Off, but wait, because this Black Friday (and maybe earlier) we have a massive 50% Off Sale on Drive Thru RPG. This includes books compatible with Dungeons & Dragons and the Pathfinder Roleplaying Game, as well as stand-alone games, map tiles, and all of our Solo Adventures. This has 2.5 stars out of a possible 5, making it our worst rating, for any product, ever. Still, if you read the reviews objectively, you’ll notice that nobody’s complaining about the rules, which are water tight. The book might not show you how to design your own mecha, but attentive readers will be able to reverse engineer the system and create anything they want, using the core Starfinder Roleplaying Game rules. What’s a little murder between friends? A lot of fun, it turns out. The game’s rules are so intuitive that you might be tempted to think the game is overly simple. In fact, the game’s streamlined for an evening’s dinner party with friends, and makes intrigue an integral part of the experience. We think you’ll find that How to Plan a Murder has something special that most murder mystery dinner games lack. Check it out. This book is so beautifully illustrated that it’s worth grabbing, just for the pretty pictures. The art is by Bob Greyvenstein, who does most of our illustration and layout work, and this book contains many of my favorites of his art. It takes real talent to draw birds well, and Bob pulls it off with apparent effortlessness. Our Choose Your Destiny line of solo 5e adventures is steadily growing, but it all starts with this, the first adventure in the series. The second book, Forest of Secrets, is also on sale. The books contain rules for extending the game, as well as player boons and class archetypes, so they’re valuble resources for GMs too. This brings us to my top recommendation for Black Friday, 2018. Scarthey, the University of the Arcane, is your guide to adventures in a wizard’s university, complete with map, location guide, introductions to the main faculty members, houses, the surrounding town of Scartheyton, history, activities, and sports. You can set your whole campaign within the grounds of the university, or drop it straight into your campaign. Our Choose Your Destiny adventures are set in Scarthey and its surrounds, making Welcome to Scarthey an invaluble part of the collection. The Player’s Handbook, Dungeon Master’s Guide, and Monster Manual all provide great resources for undersea or ocean-based D&D campaigns. We’ve offered you an Undersea Guide to the Player’s Handbook and an Undersea Guide to the Dungeons Master’s Guide. Today we’ll be talking sea monsters with the Dungeons & Dragons Monster Manual. This week’s post is part of the RPG Blog Carnival. This month the carnival is hosted by NukeTown.com, and the theme is “All These Worlds.” Be sure to check them out and see what others have shared on the topic. The Monster Manual is full of useful creatures for your undersea campaign, and the easiest way to access these is to refer to appendix B in the Dungeon Master’s Guide, which lists coastal and underwater monsters. Below is a list of suggestions for expanding on those lists. Many creatures can become sea monsters by giving them the ability to breathe underwater and a swim speed. Twig blights could become seaweed blights, while you could replace a frost giant’s greataxe with a trident and call it a sea giant. Be careful with some monster abilities though, an ocean basilisk could pose a real problem for characters who can’t breathe underwater. Most undead creatures can survive underwater, without any modification. Adding a swim speed is usually all that’s needed to make them effective threats. Ethereal undead, such as ghosts, can use their fly speed instead of a swimming speed, making them difficult to escape. Similar to the undead, constructs don’t need to breathe, so giving them a swimming speed is usually enough to make them useful. A homunculus might have a swimming tail instead of wings, while golems might be formed like sharks or dolphins, giving them a swimming speed and a reduced base speed. You can also replace some golem abilities with ones from other sea monsters; like giving a flesh golem tentacle attacks to replace its slam attacks. Common sense if your greatest ally here — a stone golem is more likely to sink than swim. When it comes to sea monsters, a little creativity goes a long way, and the Monster Manual serves as an excellent starting point for populating your campaign world. What would you like us to cover for your undersea campaign next? Let us know in the comments below. We recently asked about trinkets in your D&D game, and we’d love to hear your ideas, especially if you’ve got some ocean themed ones.